Learning to drive is a rite of passage as a teenager. Most youngsters can’t wait until they are old enough to enroll in driver’s ed and start the process of getting a new driver’s license. The process begins with a driver’s ed course, which prepares you for the driver’s license test. The license test must be passed for a driver to receive a license, and it is comprised of various components that demonstrate your ability to safely drive a vehicle on the road while following traffic laws. The team of experts at Drivers-Licenses.org knows preparing for this exam can be stressful, so we have compiled further information on each part of the test that you can expect to take below. Driving a vehicle on any roadway requires the driver to know the necessary traffic laws to maintain the safety of every driver on the road. The written portion of the exam is administered by the DMV, and it contains questions that showcase your driving knowledge. The written exam is usually multiple-choice. It is vital for every driver to know the mandatory traffic laws and how to drive with other vehicles on the road. You should know how to react in various driving situations including stop lights, intersections and navigating through curves in the road. You should know how to share the road with other motorists and how to adjust your driving in various weather conditions. You must pass this portion of the driver’s license test to qualify for your license. There are practice tests available online and through your local DMV office to prepare you to take the actual exam. The team at Drivers-Licenses.org suggests taking a practice test so you know what types of questions to expect. Drivers must be able to see everything on the roadway to keep themselves and others safe. The team at Drivers-Licenses.org knows that having complete vision of what is going on around your vehicle is important, and it can prevent accidents from occurring. Your state may require you to take a vision test to receive a driver’s license. This exam is much like the basic eye exam you would receive at an eye doctor or at a school. If you don’t pass the vision portion of the exam, you can submit a written eye exam report from your physician. Taking a written exam may show that you understand the material, but you are required to put your skills to the test on the road. The road test is the most nerve-wracking part of getting your license, but it doesn’t have to cause you stress. The instructor is there to encourage you and make you feel comfortable. The driving test will be administered by your local DMV or a certified driving school, and it is composed of two main parts. 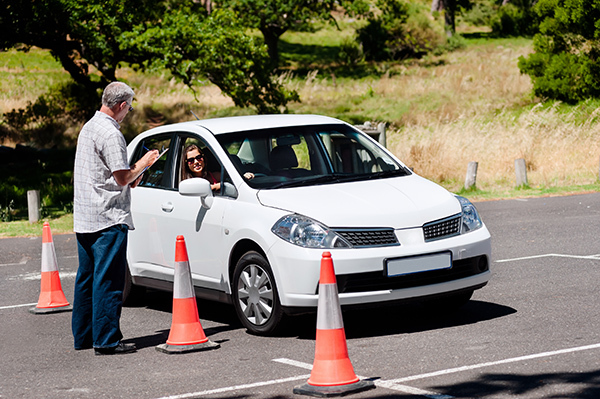 The more basic portion of the test usually takes place in a parking lot, and it involves the student demonstrating turns, parallel parking, and knowing when to use the turn signals. The second part of the test involves the student driving on the actual roadway. This portion of the test proves that you know how to drive with other cars on the road, and that you can follow the flow of traffic while obeying traffic laws. It’s okay if you don’t pass the driving portion of your driver’s license test the first time. You can always retake the driving test, and you should contact your local DMV if you need more information on retaking any portion of the exam.